NGC4725 is a medium sized galaxy positioned around center of a constellation of Coma Berenices. The galaxy isn't so well known because there are many famous galaxies being distributed around this star-field. However, it has a diameter of 10 arc minutes and 10th magnitude, it's certainly worth seeing. NGC4725 is a galaxy classified in so-called the "Bared galaxy"; it consists of bar-structure across the nuclei and a pair of arms surrounding them. 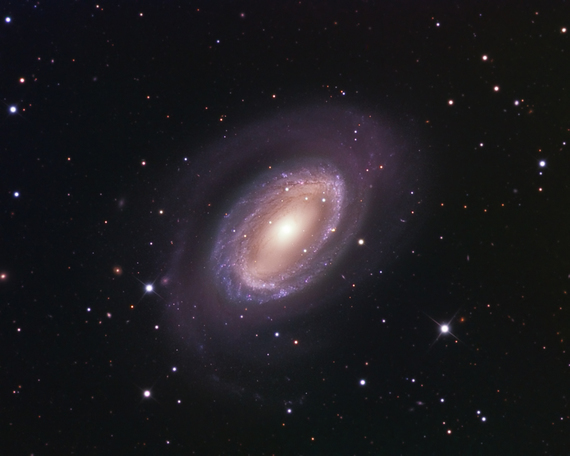 The arms of NGC4725 are coiled up fairly tight, it seems that the arms surround the galaxy in circumference. Used with permission, No reproduction of these images are permitted without written approval from Mazlin.